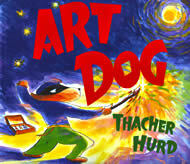 ​Thacher Hurd has written and illustrated over 25 children’s books, among them Art Dog and Mama Don’t Allow, which won the Boston Globe Horn Book award and is on Time Magazine’s 100 Best Children’s Books of All Time list, as well as Mystery on the Docks and Zoom City, a New York Times Best Illustrated Book. 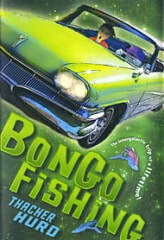 His recent books include The Weaver, Bad Frogs, and his first middle grade novel, Bongo Fishing, which was published in 2011. 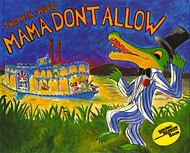 For many years, Thacher and his wife Olivia, owned and operated The Peaceable Kingdom Press in Berkeley, a poster and greeting card company started with an image from Goodnight Moon, which his father illustrated, and which was named for the family farm in Vermont, publishing illustrations from children’s books as greeting cards, posters, invitations, and calendars. They have two sons, Manton and Nicholas, and divide their time between Berkeley and Vermont. Thacher continues to write and play the banjo and fiddle and hang out with adorable grandchildren.